The American Mastiff has a much dryer mouthed than other mastiffs. The dryer mouth is due outcrossing the English Mastiff with Anatolian Mastiff, which occurred early in the development of the breed. 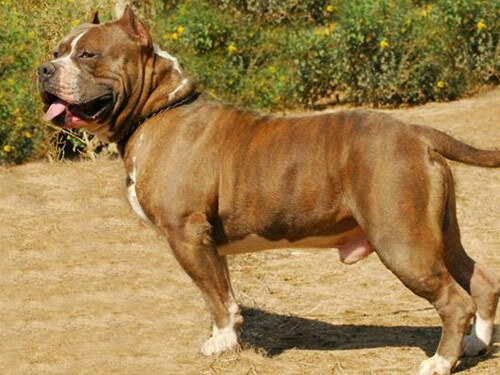 The American Mastiff is a large, massive, and powerful dog. The head is wide, heavy and rectangular in shape. The eyes are amber in color. Darker the better. The ears are rounded and set high on head. The muzzle is medium size and well proportioned to head and has black mask. The nose is black; It has a scissor bite: . The neck is powerful, and slightly arched. The chest is deep, broad and well-rounded, descending to the level of elbows. The ribs are well-sprung and extend well back. The back is straight, muscular and powerful, with well muscled and slightly arched loins. The forelegs are strong, straight and set well apart. The hind legs are wide and parallel. The feet are large, well shaped and compact, with arched toes .The tail is long, reaching the hocks. Puppies are usually born dark, and lighten as they grow older, some becoming very light fawn by age one year; some retain dark hairs. Colors are fawn, apricot and brindle. White markings acceptable on feet, chest and chin/nose; Temperament: Dignity rather than gaiety; quiet, calm, loving and loyal. Protective, but not aggressive. American Mastiffs tend to be healthy happy dogs with fewer reported incidents of many of the health problems you see in other large breeds. American Mastiffs do just fine in an apartment with daily exercise, a walk will do, or a run in a fenced in yard. As they grow older they tend to become a little lazy. They are relatively inactive indoors ("couch potatoes") and a small yard will do. Mastiffs are inclined to be lazy but they will keep fitter and happier if given regular exercise. Like all dogs, the American Mastiff should be taken on daily regular walks to help release it's mental and physical energy. It's in a dogs nature to walk. They should always be leashed in public.